Have You Ever Considered Owning a Home Away From Home in Italy? ​Maybe you have had this dream sparked by “A Year in Provence” or “Under the Tuscan Sun” or just through your own travels to Europe. My name is Marcus Farbstein and my wife and I have been on such a quest for more than a decade. We realized that unless we moved to France or Italy full time the solution was Fractional Ownership. This concept, very different from Time Shares, and is more well known in Europe. Fractional Ownership allows a small group to share in deeded ownership of a single property for their mutual benefit. Ownership is typically divided into four-week blocks and can be a fixed or rotating period. Costs are shared for upkeep and utilities. The goal is to find a place you want to spend time in with a reasonable investment that is also transferable to the next generation or can be resold. In a town we love, that is not a big tourist destination. The town must be livable (all the amenities close by). It must be easy to reach – close to an airport and a major train terminal. The climate should be temperate for most of the year. There should be plenty of restaurants, a farmers market, and convenient shopping. The town should be walkable. The property should have plenty of garden space and a view. The home should be energy efficient, low maintenance and incorporate smart technology. Initially we hoped to find an existing property that fit our criteria and just join, but this is easier said than done. We started in Tuscany and found some wonderful places, but they were hard to reach and the small towns nearby have limited amenities. Driving an hour for groceries or two hours to the closest airport is a limiting factor (for us). After much research and driving all over northern Italy we narrowed our search to two adjacent towns, San Terenzo and Lerici. Dealing with the complexities of the Italian real estate process and culture required patience. As often can happen, serendipity played a part. We made a connection with a local family that was building a “villa” to replace a small home of the grandmother. They planned a three flat house, retaining one for themselves. Our property is a two bedroom, two bath flat, with surrounding gardens and sweeping views. 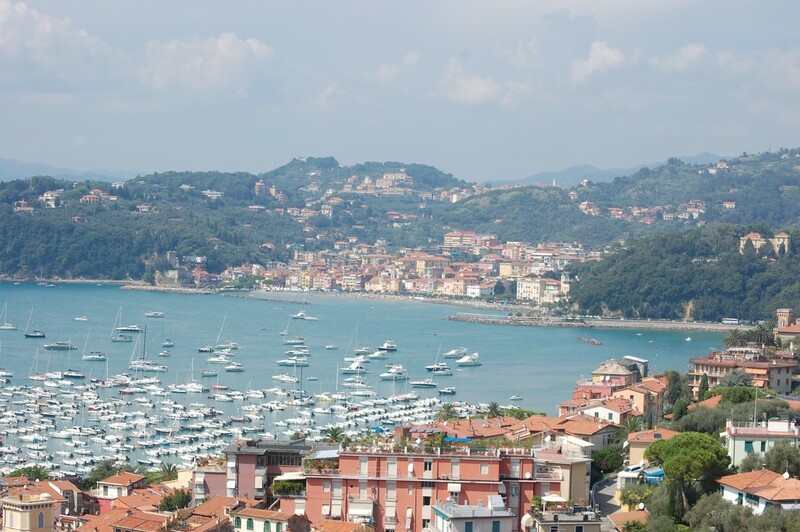 Lerici, the town at our feet is a short walk to the town center and another 10 minute stroll to several sandy beaches. This photo is the view from the villa. The town in the foreground is Lerici, and the town in the distance is San Terenzo, a three-kilometer walk along a promenade that passes several beautiful beaches on the Mediterranean. Please join me for an information session at the Italian Store in Westover on Thursday, April 19th!